​Adjacent to The Whaler resort, as you follow the gentle curve of Kaanapali Parkway, you will come upon the remarkable golf course of Royal Kaanapali. The resort has secured entry and a uniformed security guard onsite 24 hours a day. Within the marble floored lobby, a bellman, full service front desk staff, and concierge are available to assist you. Parking is available underground between the two towers. Security continues as a pass key is the only way to gain access to each of the towers, which have the convenience of three elevators ready to raise you to one of the twelve floors above. The Whaler on Kaanapali Beach is a luxury, high-rise, condominium complex located in the heart of the Kaanapali Beach Resort. Fronting the beautiful golden sandy beach of Kaanapali, owners and guests continue to cherish the joys of oceanfront living with endless activities of sailing, snorkeling, diving, dining, and world class shops are only steps away from your air conditioned luxury condominium at The Whaler. The twin towers rest on 6.67 acres, and contain a total of 360 units including studios, one bedroom one bath, one bedroom two baths and two bedrooms two baths. One of the newest renovations to the resort is their tranquil courtyard. Saunter through the paths over a bridged Koi pond while enjoying the sounds of the waterfall nearby. The courtyard walkway brings you to private cabanas and a newly remodeled pool area. Resort Fee paid at Front desk on departure: $20/day includes: Wireless Internet, HD Cable TV, Gym, Oshibori Towels and water in Lobby, Pool Umbrellas, Beach Towels and other services. currently at 14.416% effective as of July 1, 2010. Minimum night Requirements may apply. etc..
​The Royal Kaanapali Golf Courses offer a discount to guest staying at a Kaanapali Resort. When you book your golf, tell them you are staying a Kaanapali Resort and give them your unit number to receive the discount. The direct phone number to reserve your time is (808) 661-3691. Whaler 123 is a spacious inner court, ground floor condo, ideal for families or couples looking for a peaceful environment to relax after a day in the water, out Maui sightseeing or on the golf course. The condo is unique within the Whaler property because it is decorated tastefully throughout with Maui marine artwork by Robert Lyn Nelson. Thus one can fully enjoy and appreciate the beauty of the Maui waters also inside the condo! The great ground floor location of 123 offers a spacious private lanai with a wonderful glimpse of the ocean. Whaler 123 is ideally located on the world famous Kaanapali beach within easy walking distance to World Famous resorts, restaurants, shopping, and golf courses. Elegantly remodeled for the discerning traveler, Whaler 124 is a ground floor condo, ideal for families or couples looking for a peaceful environment to relax after a day in the water or out sightseeing the beauty of Maui. 124 is tastefully decorated and features a quality remodel with granite counter tops. It is a 1 bedroom 2 bath garden/ocean view condo with a wonderful corner location featuring a wrap-around deck that enjoys a spacious open lawn area and ocean view from the lanai. Amenities: The kitchen is fully equipped and furnished with a stove, oven, refrigerator, dishwasher, microwave, toaster, and blender. The unit also offers 2 HD flat screen televisions with basic cable service. Located steps from the ocean, this condo enjoys some of the best Maui has to offer. Relax to the lapping of the ocean and breathtaking sunsets. In condo 224 you are just a few steps from the famous Ka’anapali beach and refreshing oceanfront pool. You can also take a stroll on the oceanfront sidewalk, which will take you past the all the amazing restaurants and shops. Reserve Whalers 224 today and begin you dream Maui vacation. Whaler 252 is a beautiful corner oceanfront condominium with a spacious wrap-around lanai. The expansive breathtaking views make this property one of the most popular in the building. It is a completely remodeled 2 bedroom 2 bath that promises a truly premium experience. Island-style furnishings welcome you to relax Hawaiian style and the updated kitchen with granite counter tops makes cooking a pleasure. Whaler 252 has a King bed, a set of double twins, queen sofa bed and a futon accommodating up to six guest.Amenities: Fully equipped kitchen, washer and dryer (stacked) including detergent, central air conditioning, Flat Screen TV’s, Wi-Fi, bed linens, towels and common area BBQ. This beautiful condo is one unit back from the ocean on the non-windy sunny side. It is the perfect place to begin your dream Maui vacation. Located in the heart of Kaanapali, all the best Maui has to offer is at your fingertips. 357 is tastefully decorated and features a quality remodel with granite counter tops and a fun tropical decor. Your location on the third floor provides quick and easy access to the beach - just two flights of stairs or a quick elevator ride and your front and center on the best beach Maui has to offer. The kitchen is fully furnished. Washer and dryer in unit, 2 HD flat screen TVs with basic cable and free Wi-FI. Located in the heart of Kaanapali, this spacious condo offers one of the best locations on Maui. In condo 364 you are just a few steps from the famous Kaanapali beach and refreshing oceanfront pool. Ready for some action take a stroll along the beachfront sidewalk enjoying the amazing hotels, restaurants and shops of this world famous resort. Reserve Whalers 364 today and begin your dream Maui vacation.Resort Fee paid at Front desk on departure: $15/day includes: Wireless Internet, HD Cable TV, Gym, Oshibori Towels and water in Lobby, Pool Umbrellas, Beach Towels and other services. This immaculate Whaler ocean view 1 bedroom 2 bath offers ocean views out to the Island of Molokai, a quality tropical decor, king size bed in master, queen sofa bed in living room, remodeled fully equipped kitchen, and spacious lanai. Located on the 4th floor of Tower II, #470 offers the perfect location to enjoy a quiet fun filled vacation while taking in the views of Kaanapali beach and the beautiful Whaler courtyard. Kaanapali Beach is consistently rated as one of the top beaches in the world. The Whaler is located in the center of Kaanapali’s best stretch of swim-able beach. If you wish to go snorkeling, just walk down to the beach, jump into the water and snorkel around Black Rock, one of the top snorkeling areas on the entire island - right out your back door. The Whaler is the most newly renovated resort on Ka'anapali Beach, next to the Whaler's Village (65 shops and restaurants with direct access), with two world class golf courses out the back door. Of course, the Whaler also has an oceanfront pool with a hot tub, a beach kiosk with towel service, tennis courts, an onsite spa, gym, business center, concierge and an activity reservation desk. You will be enjoying Maui's premier resort amenities while realizing substantial savings versus staying in a hotel. Whaler 557 is a 1 bedroom 2 bath located just behind the ocean front on the 5th floor of tower 2, facing Whalers Village. 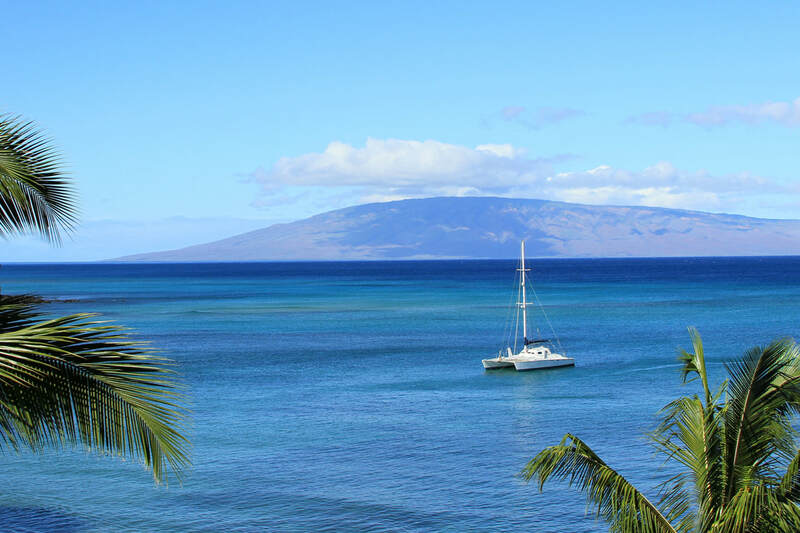 The island of Lanai and sail boats in the harbor can be seen from your lanai. This beautiful home is well appointed with upgraded kitchen and bathroom. The island-style decor has the tropical feel that every visitor is looking for. The Whalers resort offers a Gym, Spa, Tennis, an oceanfront pool, Jacuzzi and much more. Amenities: Fully upgraded bathroom and kitchen, blender, microwave, coffee maker, dishwasher, iron/ironing board, (2) TV, free Wi-Fi, DVD, air conditioning, washer / dryer, interior decorator finishes new furniture. This spacious condo offers one of the best locations on Maui to enjoy the lapping of the ocean, breathtaking sunsets, top of the line restaurants, and exceptional shopping. In condo 562 you are just a few steps from the famous Ka’anapali beach and refreshing oceanfront pool. You can also take a stroll on the oceanfront sidewalk, which will take you past all the amazing restaurants and shops. Reserve Whalers 562 today and begin you dream Maui vacation. Resort Fee paid at Front desk on departure: $15/day includes: Wireless Internet, HD Cable TV, Gym, Oshibori Towels and water in Lobby, Pool Umbrellas, Beach Towels and other services. This 1 Bedroom 2 Bath unit offers beautiful Pacific views including Black Rock and the island of Molokai. It’s quality tropical décor includes a king size bed in the master bedroom, queen sofa sleeper in the living room, fold out double futon, fully equipped kitchen, and a spacious lanai. Located on the 5th floor, #570 offers the perfect location to enjoy a quiet fun-filled vacation while taking in the views of Kaanapali Beach and the beautiful Whaler courtyard including the meandering koi pond. Fully equipped kitchen, blender, microwave, coffee maker, dishwasher, iron/ironing board, Wireless Internet access, cable service, 42” Flat Screen TV in living room, TV in bedroom, DVD Player, Central air conditioning, bed linens and towels. Elegant 1 bedroom 2 bath OCEAN VIEW Kaanapali Condominium – Ka’anapali’ s best location & value – The Whaler - front and center on the best BEACH on Maui . 624 offers the largest one bedroom floor plan with a double size wrap around lanai capturing a panorama of views form the ocean blue to the mountains, golf courses and resorts of Kaanapali. Beautifully furnished with quality kitchen and upgraded bathrooms this is a home you will be proud to share with your family or friends. Ocean views on Kaanapali Beach from the South tower facing Black Rock. In addition to the TV in the living room there is also a TV in the bedroom. Bring your CD's from home and listen on the player provided. Bring your laptop and enjoy free high speed DSL internet access in the condo or use your laptop with wireless card in the lobby for $12.95/day. The Whaler charges $15/day for parking. This beautiful condo is a perfect location to map out your adventures for the day. Hawaii's best beaching, snorkeling, surfing, boogie boarding, scuba diving, kayaking, and whale watching make Kaanapali beach truly an ocean lovers playground.We welcome you to come for a visit and return time and time again to enjoy the wonders of this wonderful Maui treasure. Book Whaler 708 today and begin your dream Maui vacation. Beautifully furnished in immaculate condition with light Berber carpeting and a luxury tropical decor. Stunning ocean views of Black Rock and Molokai make this one of the Whalers most desired locations. Resort Fee paid at Front desk on departure: $15/day includes: Wireless Internet, HD Cable TV, Gym, Oshibori Towels and water in Lobby, Pool Umbrellas, Beach Towels and other services. This deluxe 1 BR/2 BA condo was remodeled in 2008! The kitchen has been completely remodeled with granite countertops, updated appliances, wood cabinets, and newly refinished wood flooring. The king-size bed is a top-of-the-line Simmons Beautyrest. Two full-size marble bathrooms also have been remodeled with new mahogany cabinets and fixtures. This condo has a spacious floor plan and an OCEANFRONT ON THE BEACH, not just an ocean view. ​This is a great studio vacation rental in the heart of Kaanapali on one of Maui's best beaches! As you can see the unit has great views of the ocean from the lanai and over looks Whaler's Village, where you can find all your shopping needs. This unit has a King bed and a Queen sofa sleeper. This property has several amenities for you to enjoy from a pool to a spa! Located in the heart of Kaanapali, the Whaler enjoys some of the best Maui has to offer. This beautiful condo is a perfect location to map out your adventures for the day. Hawaii's best beaching, snorkeling, surfing, boogie boarding, scuba diving, kayaking, and whale watching make Kaanapali beach truly an ocean lovers playground. Jump start the blender, mix up a cool tropical libation, or light up the oceanside grillceanside as the stars appear after the fiery sun disappears into the pacific blue.We welcome you to come for a visit and return time and time again to enjoy the wonders of this wonderful Maui treasure.Resort Fee paid at Front desk on departure: $20 day includes: Wireless Internet, HD Cable TV, Gym, Oshibori Towels ond water in Lobby, Pool Umbrellas, Beach Towels and other services. Whaler 908 is quiet, private, elegant and spacious and located on the best BEACH on Maui. Truly Kaanapali's best value - enjoy your spacious ocean view Villa with family and friends for the price of a hotel room.The Ocean View Villa is a spacious luxurious air-conditioned, 1 bedroom 2 bath, 9th floor condo, with large balcony, located at the world famous Whaler in the heart of the Kaanapali Beach Resort. Elegantly remodeled for the discerning traveler. Tropically decorated with beautiful decor and local artists. Awe inspiring views of ocean, Black Rock, Molokai and golf course. Custom tropical ocean art in Full equipped Kitchen. Corian and granite kitchen & bathroom countertops – quality throughout! Gorgeous spacious Master In-suite with spacious custom shower. Located in the heart of Kaanapali, this Whaler condo enjoys some of the best Maui has to offer. Relax to the sound of the surf, tropical breezes, and breathtaking sunsets. In condo 962 you are just a few steps from the beautiful Ka’anapali beach and refreshing oceanfront pool. Ready for some action? Take a stroll along the beachfront sidewalk enjoying the amazing hotels, restaurants and shops of this world famous resort. Reserve Whalers 962 today and begin your dream Maui vacation. This immaculate 10th floor Whaler studio offers sweeping ocean views, a professional tropical decor with a king size bed, dining table, fully equipped kitchen, a spacious lanai, and ideal location on the tenth floor of Tower I. 1018 enjoys spectacular views of the ocean, Black Rock, West Maui Mountains, and the beautiful Island of Molokai. Whaler 1174 is a one bedroom, two bath ocean view unit located on the courtyard corner of Tower II. It`s 11th floor location provides expansive views that stretch from the lush West Maui mountains across the courtyard and out to Kaanapali Beach. The lanai wraps around the corner of this condo running along two complete sides making this one of our most popular condos of our returning guests. King bed in master, queen sofa sleeper in living room. The Elegant Oceanfront Villa is a luxurious air-conditioned, 2 bedroom, 2 bath, 12th - top floor - penthouse condo, with large wrap around balcony, located at the world famous Whaler in the heart of the Kaanapali Beach Resort. The open concept high ceiling floor plan with the large living room and wall to wall windows invites you to enjoy indoor/outdoor living. Awe inspiring views of ocean, outer Islands, Black Rock, sunsets and golf course. Huge wrap around Lanai with 270 degrees views. Spacious Fully equipped kitchen – everything you need to entertain. Gorgeous Master In-suite with spacious custom shower. Free Wi-Fi High Speed Internet – Large Flat Screen TVs in living room and bedrooms. Central Air conditioning or screen doors to enjoy the trade winds. This beautiful condo, which boasts a recently remolded kitchen and appliances by Fisher and Paykel, is a perfect location to map out your adventures for the day. Hawaii's best beaching, snorkeling, surfing, boogie boarding, scuba diving, kayaking, and whale watching make Kaanapali beach truly an ocean lovers playground. In condo 1216 you are just a few steps from the beautiful Ka’anapali beach and refreshing oceanfront pool. We welcome you to come for a visit and return time and time again to enjoy the wonders of this wonderful Maui treasure.